Ann Allan – Happy memories of East Belfast | Vixens With Convictions! We are delighted to welcome Ann Allan as our newest Vixen. Below is a piece detailing her memories of growing up in the 60’s and 70’s, and her fondness for East Belfast. I arrived in East Belfast in October 1966. I was 17 and apart from an exchange visit to France for a month I had never been away from home on my own. I came from Rostrevor, a small seaside town and I was used to all the comforts of home. I had left school and was lucky to get a job in the Civil Service as a Clerical Officer. Things weren’t going too well at home as I had fallen for a young Scottish protestant. This was not on for a young Irish Catholic girl in those days. It was many years later when tracing my family tree that I discovered that I was not actually native Irish and our ancestors in fact hailed from Somerset. Oh the irony! The local Parish Priest had been alerted that one of his flock was ‘walking out’ with a protestant and he was none too pleased. It was then that I decided to head for the big smoke, where I hoped the citizens of Belfast were more enlightened, but that was not the case. On my first morning in my new job my new boss remarked to her colleague that she had prided herself on an all protestant section until I came along. Tricks were played on me my other members of staff but I was tough or naive and so ignored it. Anyway, I arrived a bit bewildered at Bryson Street where there was a girls hostel called St Paul’s. I was met at the door by Sr Adriana a rather stern looking nun who proceeded to read out the rules. The charge was £2 per week. This was to include breakfast, evening meal and supper. Ten shillings extra if you stayed the weekend. Hot water was provided on a Monday night for two hours, otherwise the water was freezing. By the time we all tried to wash our hair, there was no hot water left. Anything left on the floor of the dorms was confiscated and 2d per item would be charged for its return. There were about 30 girls in the hostel and we slept in individual cubicles surrounded by a flimsy curtain, our only bit of privacy. I soon settled in and got to know my way round the area, Seaforde Street, Chemical Street and the Newtownards Road. A local chip shop on the Newtownards Rd helped to sustain us growing girls and a local shop at Chemical St or Susan St ( I can’t remember which) sold cheese from a large block. No Health and Safety in those days. Inglis had a bakery beside the Ropeworks and the pastries were delicious. As we passed the houses on our way to the hostel each evening the residents came out to say hello and everyone was friendly. On many occasions we went over to the Protestant church up the road and had a chat with the Minister. In those days a trolley bus ticket into town was 4d and it was possible to walk home in the early hours of the morning from The Orpheus, The Astor and the students union at Queens, crossing the Queens bridge without any hassle. Those were carefree years and we enjoyed them to the full. All the big groups came to Belfast and there was always a show to go to. I saw the Beach Boys, Gene Pitney, Neil Sedaka, Them, to mention a few. I saw the premiere of The Sound of Music in the Odeon while the Free Presbyterians demonstrated outside, because of the Catholic theme in the film . After a year a few us moved to a flat in the university area and my Scotish planter joined me up in Belfast. Within a short time the troubles started and the nights echoed to the sound of gunfire and bombs. The theatres closed and Belfast became a no go area for tourists. Many nights returning from home after the weekend, our bus was diverted through streets that had burning barricades and we travelled in fear of been hijacked. But I loved Belfast and I returned to East Belfast with Gordon and we have been together for almost 49 years. I was 16 when we met and married at 21. We weren’t allowed to marry in my home town and I have happy memories of being escorted up the Crumlin Road by two army jeeps. We planted some seeds of our own and our offspring grew up mixing with all religions and kept up the tradition set by their parents. 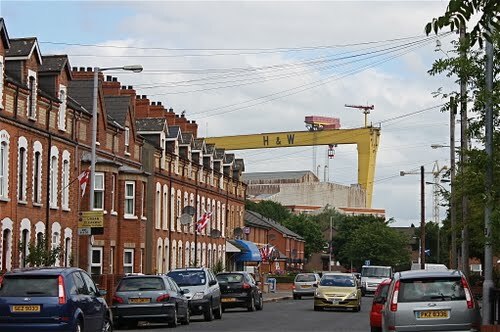 East Belfast unfortunately gets bad press but it is a lovely place to live and I remember the 60’s with affection. ‹ Victims Blog : Ann Travers : Gerry Adams court case, memories and pensions. Amazing what you can remember when you put your mind to it. Glad you enjoyed it.